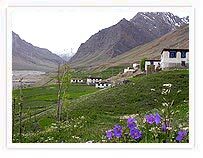 This trip offers an incredible insight into the remote Spiti and Pin Valleys of Himachal Pradesh. From the lush green Kulu Valley, enter the starkly beautiful Spiti Valley, visiting ancient gompas and scattered little villages. After crossing the Baba pass, the landscape changes dramatically, with the barren lunarscape of Spiti being replaced by thick forests of pine, cedar and deodar. 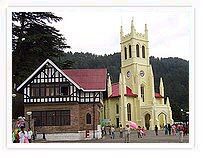 The trek ends at Simla, the summer capital of the British Raj. Highlights of your trek starts from Manali onwards and end up in Shimla. Manali and Shimla are well connected by road and flight from Delhi and further arrangements will be provided as per the request. Travel by Toy Train from Shimla to Kalka may be an advantage to explore more and recommended. Drive along the Beas River upstream along the true left bank through the villages of Bhang and Palchan, the last inhabited village in the Kulu Valley beyond Manali. Start the climb from Palchan village to Rohtang la via Gulaba and Marhi, the winter ski slopes which are used by local shepherds as summer pastures. The Beas, one of the major rivers draining the fertile land of Punjab, originates from a spring just below the Rohtang la. In summer, one can see masses of Indian tourists and honeymooners visiting Marhi and Rohtang la to enjoy the snow, which stays usually up to July. There are a profusion of Chai shops and makeshift restaurants. The road beyond Marhi is broken and rough since it is used by heavy military and civilian convoys, carrying supplies to Lahoul, Spiti and Ladakh. Stop for a while on top of the pass at a chai shop to have hot cup of tea. From Batal a steep drive of 11 km. will bring you to the top of the Kunzum la (14,800 ft/4,500 m). From here you get the first glimpse of Spiti valley running 200 km. across from north-west to south-east with the Spiti river drained from the glaciers to the left of Kunzum la. Since you have climbed more than 6,000 ft in a day it is advisable to move around and go for a walk after camp has been set up to help acclimatize to the altitude. After breakfast drive through the village of Lossar and stop to visit the monastery. 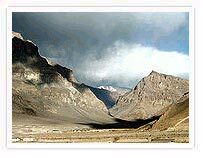 The topography of Spiti is marked by high mountains and narrow river valleys with flat land being an uncommon occurrence. Drive through the villages of Hansa, Kyato, Pangmo, Hal, Morang, Murling, Khyurik and Rangrik. You get awesome views of Ki gompa from Morang village across the Spiti river. Cross the Spiti river just 2 km. before Kaza and drive along the true left bank of the river. Visit the famous Ki gompa and Kibbar, the highest permanent inhabited village in the world, situated at the altitude of 14,200 ft/4,303 m. Ki, a beautiful gompa perched high on a pyramid-like mountain, belongs to the Gelug-pa sect of Tibetan Buddhism and has almost 40 resident monks practicing meditation and other monastic rituals. Return to the main road and drive steeply uphill for another half hour to one of the highest permanently inhabited villages in the world. Located in a semi bowl-shaped narrow valley, Kibber has a population of about 200 people mainly involved in the farming of barley and wheat. The light is just perfect an hour before sunset to photograph this unique village. Camp is set near the helipad after crossing Kaza, the district headquarters of Spiti valley. After an early breakfast drive on the link road and climb steeply to a most incredibly-situated gompa, perched high on barren rocky mountain slopes. As you progress, the whole Dhankar village opens up in front of you like something artificial crops up from nowhere. The 6th century Dhankar gompa, though not well preserved still has some magnificent original tangkhas and statues tucked away in dark rooms. Return to the main road and drive to the bridge of Attargu, from here, cross the Spiti river by a pucca bridge and follow the Pin - one of the major tributaries of the Spiti - upstream. Drive through the villages of Chidang and Gyuling. Camp near the village. The Pin valley is known to be full of wildlife - ibex, khangral, marmot, bharal, are commonly seen on the high slopes with the elusive snow leopard occasionally visible looking for prey. In the afternoon walk around and explore the Pin valley. Visit the monastery at Ghungri which is the main centre of the Nyingma pa sect in Spiti. The monastery is believed to have been founded by Guru Padmasambhava. Overnight camp. The trek begins by crossing the river. A short up-hill walk through rocky terrain veering to the left offers wonderful views of the Pin valley below and Khar and Sagnam villages. Trek along the high banks of the river for a couple of hours, going over rocky land, meadows and cultivated fields up to the village of Tiling, which lies at the confluence of the Kuokli Gad, a side stream, and the Pin river. Camp is set here for the night. The trail follows the Pin river for a while, before a short steep climb through scree, followed by a gradual climb up the hillside and along vast meadows covered with a great variety of mountain flowers and berries. These are the grazing grounds of the local shepherds whose flocks often fall prey to the snow leopard. Walk past a few isolated houses in walled compounds and through green irrigated fields. The village of Mud lies across the Pin river. The village gompa is set impressively on a cliff between two streams.Overnight camp. The day begins with a gradual climb, followed by a steep ascent on scree rubble, few hours below the Baba Pass. Camp is set on the opposite bank of the stream. The going is rugged for most the day, walking over moraine, scree, boulder fields, and a final push through the snowfields to the top. As there is no defined trail, the route demands attention. After crossing the pass, a steep descent leads you to the campsite which is located on the banks of the Baba river. 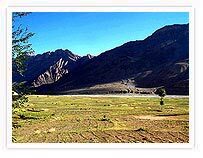 The vast grass pastures attract shepherds from Kinnaur, who bring their flocks of sheep and goats to graze here during the Spring (July to September). Overnight camp. Start with a gradual descent down the valley. The trail widens as you reach the junction of two streams. Cross the stream that you have been following from the campsite. Keeping this stream to your left, continue on till you reach the valley floor, which is usually covered in wildflowers during August and the first part of September. After a short climb, descend and cross the stream over boulders which have fallen across the width of the stream. From now on you follow the left bank of the river. Camp is set on a beautiful glade amidst prime cedar forest. Day 09 : Trek Mare to Kafni - 04 to 05 hours. Drive to Sarhan - 03 hours. Descend through an incredible mixed cedar forest till you reach Kafni village, where transport awaits you for the drive to Sarahan, the summer capital of Rampur Bushahr. The Bhim Kali temple is a big attraction and one gets magnificent views of the Sirkhand peaks. Overnight camping. Rampur is the erstwhile Himalayan kingdom of Rampur Bushahr and offers a rare insight into customs, religion, art and architecture of its people. It is one of the biggest commercial towns in Himachal Pradesh and is famous for the Lavi fair held in November. Traders from Kinnaur, Spiti and Lahaul participate in it. Men and women come dressed in traditional costumes. A special bazaar is held where they can be seen sitting in groups selling raw wool, shawls and handicrafts, along with walnuts, almonds and other dried fruits. While the days are spent in making bargains, the evenings are given to song and dance. Drive via Narkhanda, which offers ski slopes with training facilities during the winter months, to Shimla. Spread across 12 km along a ridge that overlooks terraced hillsides and cultivations, Shimla is magnificently robed in dense forests of oak, pine, fir and rhododendron.